The term "accessibility" as used on this website means "usability." The use of the symbol does not indicate full compliance with all accessibility standards. However, all walks are level – meaning no steps or grades of 8% or higher. All intersections have curb cuts unless noted. All walks have been done with a person in a wheelchair and some have been done with a person using an electric scooter. If you don't have a car, or just prefer not to drive, you can get to many of these excursions using public transit. The maps included with the self-guided excursions indicate bus stops and Muni route numbers. Black and white bus icons indicate wheelchair-accessible lines; gray and white icons indicate non-accessible lines. The Excursions page has a listing of Muni and BART routes for both self-guided and guided walks. For best riding conditions, avoid the morning and evening rush hours. Ride with a friend if you think you'll need assistance. On all transit vehicles, non-disabled passengers must yield the seats nearest the doors and driver to seniors and disabled people. Within San Francisco, the primary transit agency is the San Francisco Municipal Railway (Muni). Muni provides frequent bus and light rail service throughout the City. Muni maps are sold throughout San Francisco, and are posted at bus shelters. Notice the frequency chart on the back shows wheelchair-accessible routes marked "X"; trolley coach lines marked "TC." The Muni website has comprehensive Accessibility Information. Nearly all of Muni's diesel buses are equipped with wheelchair lifts and can "kneel" (lower the front of the bus) if you have trouble negotiating stairs. The driver makes space for wheelchairs by folding up several seats near the front of the bus, and can assist the passenger in the wheelchair to fasten the required safety straps or wheel lock. Wheelchair users may also transfer to a fixed seat and keep their wheelchair folded in the adjacent aisle. The big trolley buses on the 14 Mission, 31 Balboa, and weekend 30 Stockton lines accommodate wheelchairs similar to the diesel buses. The smaller trolley buses that serve the rest of the city are not currently accessible - seek out adjacent diesel bus lines if necessary. Muni plans to purchase modern trolley coaches with wheelchair lifts. Muni's Metro light rail lines are accessible at eight subway stops between Embarcadero and West Portal stations. In outlying neighborhoods, some two dozen "key stops" have wheelchair-accessible boarding ramps (intermediate stops are not accessible). When boarding, watch the gap between the platform and the door! Wheelchair users may prefer to back on to the train and/or at a slight angle. Park in one of the opposite doorways, crosswise to the direction of travel. Muni's historic F line streetcars on Market Street are also accessible - the driver lays a bridge between the train and the wheelchair ramp to provide access to the train. Watch for the collapsing stairs. Call MUNI at (415) 923-6142 for accessible services or see the Accessibility Information on their website. BART provides fast, frequent rail service between San Francisco, Oakland, and outlying East Bay cities and suburbs. Opened in 1971, the trains and stations were designed to be accessible. Recent renovations have improved accessibility. Typically, elevators and escalators descend from the street level to the concourse level, and from there to the train platform. Elevators downtown are at either end of the station. As on Muni Metro, be careful crossing the gap between the platform and the train doors. Discount tickets are available for seniors and people with disabilities. Call (888) 235-3828 for accessibility updates or see the Accessibility Information on their website. 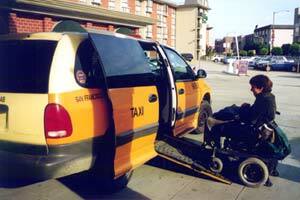 Accessible taxis are available in San Francisco. Call Yellow Cab at 626-2345. Golden Gate Transit, AC Transit, SamTrans, and CalTrain connect San Francisco with nearby cities and suburbs. All of these agencies accommodate people with disabilities. Brochures describe services in detail and offer tips for riding. All service animals must be on a leash. They may ride free, and any number of these dogs may ride at the same time. Signal dogs and service dogs must appear with their owner in the photo on the Regional Transit Discount ID card. 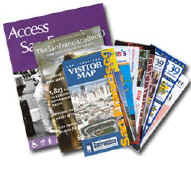 The Access San Francisco Visitor Information Kit (available free through the San Francisco Convention and Visitors Bureau) offers a guide with a comprehensive listing of "things to know" and "getting around" for visitors with disabilities. It is the first guide of its kind and will be a model for other cities as they address information on accessibility. Look here for details about museums, performing arts, attractions, sports and recreation, shopping, tours, lodging and restaurants. The kit also includes maps, special offers, and additional information. Access Northern California has access information for all of Northern California. San Francisco Bay Area, A Guide for the Cultural Tourist denotes accessible museums. Published jointly by BART and the San Francisco Convention and Visitors Bureau. MUNI Access Guide describes all of Muni's disabled accessible services including wheelchair access and kneelers (lowering of steps to enter bus). The guide is available from Muni Accessible Services Programs, 949 Presidio Avenue, San Francisco, CA 94115. Call MUNI 415-923-6142 weekdays or 673-MUNI anytime for the most up-to-date information on accessibility or see the Accessibility Information on their website. BART's All About Access brochure describes facilities, boarding, discount fare requirements, staff training, alternative paratransit, and general tips. Welcome Aboard - Your Accessible Transit Services Handbook is published by the Golden Gate Bridge District and describes the bridge, bus and ferry services available to those with special needs. For a copy, telephone 415-923-2000, TDD 415-257-4554 or visit the Golden Gate Bridge District website.